This wiki was set up to save time and effort calling people, writing e-mails, and having meetings by putting everyone's contributions, news, discussions and conclusions in one single focused area. Communication between Seladangs has never been so easy. Every Seladang member is invited to join the effort to win! If you can see this page but are unable to edit it, it means you are not a member of this site yet! Check back to your invite and click the second link to create your account, remembering that you have to register using your real name (or at least part of it) as your username for identification purposes. If you know any other Seladangs who have not given me their e-mails during our First General Meeting, please tell him/her to see me or any other Captain. Also, before exploring, please read the guidelines at the bottom of this page especially the one marked as Important. Check the i-Movie page to see whether you are rightfully credited (if you contributed to the movie). I'll put up a detailed Credits list, similar to that done for the Horror film, in the Post-Production page for you to check. Please fill up WEEK 4 of the i-Movie Schedule if you're still interested to do the i-Movie. F1s, F3s and F4s, get ready to stuff yourselves into the Comedy movie. All filming for the Horror movie is complete and I'm 75% done with the editing. Planning and recording for Tear-Jerker production is currently ongoing. UPDATE: Ok, my home Internet is alive again, so I'll be checking the wiki and my e-mails frequently. Comedy guys, I'd like to see your drafts now, thank you very much! We need to start shooting next week. I'm keeping Tear-Jerker under wraps but work is definitely being done for this movie. And seriously, no one to help us for lighting tomorrow for our (hopefully) last Horror shoot? From now on, until I inform you otherwise, please contact me by phone if you wish to tell me or ask me something about the i-Movie. This is because my Home internet is fried and I can't check the wiki or my e-mails (I'm posting from my cousin's house). If you want to discuss about the movie, feel free to post on this wiki. I'll check by for updates somehow. Thank you. Our first shooting date is on Saturday, 6th of June at my old house for the Horror movie. More details on the i-Movie page! Tip: Use the Recent Changes page to check for new updates as the i-Movie battle continues. Looking for male supporting character for the Tear-Jerker film! Needs an honest and innocent voice. Need not 'look' the type since only the character's voice would be heard during the film. However, this voice actor needs to be able to pull off the most difficult lines out of all the 3 scripts (and sob for the microphone)! Looking for a female lead character for the Horror film! Read more about it in the Screenwriting page in the i-Movie section. This spot goes to Nurliyana. We are still desperate for a plot for the Comedy film. Read more and post about it in the Scripts page in the i-Movie section. UPDATE: i-Movie team members, please fill up the i-Movie Schedule so that we know when you're free for the next three weeks. This is VERY IMPORTANT. So after emerging Maths Olympiad CHAMPIONS and therefore, overall Intellectual Events Champion, we are now leading the FHC by about 7% from the second-place Harimau! With a total score of 66.383734, we have already well surpassed the final score we got last year! BUT, we still have the Movie to play for 10%. So, remember, if you want to win it, we have to push the team a lot. Because everything has to be very close to perfection. Keep yourself updated in the i-Movie page, lend your ideas (we still need a plot for Horror and Comedy) and watch out for shooting notices! For Maths Olympiad, you all know there's a bonus audience Advanced Sudoku round worth 250 points, right?! So everyone, please print this out: http://sudokublog.typepad.com/sudokublog/files/SudokuBlank.pdf Saves the hassle of drawing boxes. If each of you that sees this prints out one sheet, it'll definitely be more than enough! I need not remind everyone that we just won Inter-House Quiz and are now leading the First House Cup by a little more than 3% right? Anyway, if you've missed today's i-Movie meeting, I basically got everyone to register themselves and pass their phone numbers to me (I obviously can't ask them to give it online here) and I asked whether anyone has extra camcorders or studio-quality microphones. Of which I think there were 3 camcorders but no mics. A schedule will be put up on the i-Movie page for you to fill in when you are not free for shooting (so that I can easily figure out shooting dates). And then I told everyone that most of the communication regarding the i-Movie will be done on this wiki, so keep checking back the 'Recent changes' page to keep yourself updated. Also, if we really want to win the i-Movie, everything has to perfect for our side. This means I may have to push the team a lot till we get a satisfying shot. So bear with us these next few weeks if you want to be on the team! UPDATE: Oh, remember that the Quiz questions are very likely to go to the floor and if anyone of you correctly answers them, we get extra marks! So start reading up on random trivia on the net or in some fact book you bought when you were a kid! If you have Readers' Digest, start reading through Word Power as it may help you clinch the Spelling sections for the Quiz. Also, read up on weird laws on the Net, sports fun facts, science fun facts … basically any kind of weird fact! Last call to practice your Ricochet Robots. Ricochet Robots is a CONFIRMED event for the Inter-House Quiz. A live feed of the board will be projected on screen and the audience bids for the lowest move count. But there's a penalty for giving an invalid answer so I recommend you check your count at least once before shouting it out! And there's a surprise event for the Quiz: Once Upon A Time. You can find out about the game here. However, there's a twist for the Quiz where 4 actors will have to act out what the storyteller is saying on-stage impromptu! It should be very funny. So show your biggest support to our actors, Afiq, Shankar, Daniel and Keshava and also our storyteller Hsu Yin! Oh, and did we mention that after today's events, we're now leading the First House Cup? THE 2009 I-MOVIE TITLE IS "SILK"
Instead of the usual 8-minute movie, we have to make three 3-minute movies of the same title: A Comedy, A Tear-Jerker, and a Spine-Tingler. I am going to hold a meeting during Lunch on Monday for those who have signed up and for those who are interested. This is extremely important as I have a few things to inform to you if you're in on this effort to make the Seladang movie. In the mean time, feel free to post your ideas on the i-Movie page. I'll be thinking of stories for each movie, but maybe you'll have better ones! 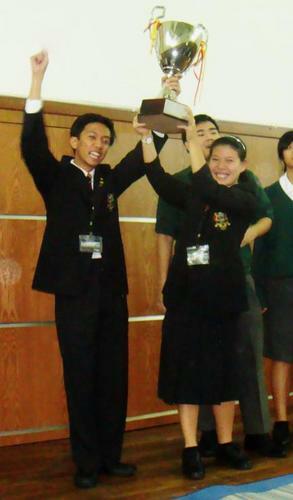 THE 2009 I-MOVIE TITLE WILL BE OFFICIALLY ANNOUNCED TONIGHT 12:00AM ON CEMPAKASCHOOLS TWITTER! I am going to hold an immediate i-Movie meeting during Lunch tomorrow for those who have signed up and for those who are interested. This is extremely important as I have a few things to inform to you if you're in on this effort to make the Seladang movie. Cancelled. It has come to our attention that private wikis impose a limit to the number of members. Therefore, to accommodate all Seladangs, this wiki has been made public. This means that anyone who knows the URL can access and browse this site, although they cannot edit it if they are not an invited member. We have taken a great leap of faith and trust in you all to make this risky decision. So please, promise us that you will not reveal this wiki, and most importantly the URL of this wiki to any non-Seladang. The best and safest way to prevent this is by only accessing this wiki at home or at least when you are very sure that no non-Seladang would be looking at what you are currently doing. If, at any case, you realise that someone has discovered the wiki's URL, inform me as soon as possible and I will change the URL of the wiki. I will then have to e-mail the new URL to all of you (except to the person who has revealed the URL). This is a messy process and I hope that I will not have to do this in the near future. We want to trust in you Seladangs. So please show us that you can be trusted. Thank you. 1. Please read and follow all the Rules below. 2. Be active in this wiki! Don't be afraid! We need your help! 3. Pages in this site are linked in the Navigation column on your left. 4. Please fill up your details in the Members page. This includes Teachers unless they request not to. 5. Use the Discussion forum on the Homepage if you need help using this site. You are free to comment on the appropriate Discussion forum (e.g. Comments on March Pass should be in the Discussion forum of the March Pass page). Click the 'discuss' button at the bottom of the page you want to comment on. Comments must be constructive to help us know your concerns. 6. Keep checking back on this wiki for updates in the 'Recent changes' link in the Navigation column. 7. Announcements from the House Captains and Teachers (not from others!) are listed at the top of the Homepage. 8. Teachers are automatically administrators for this wiki. Selected seniors will be moderators. 1. Your member username must be your name (or at least part of it). It's easier for us to identify you. 2. Unless allowed to, or if you see spelling or grammatical errors, do not edit pages straightaway. Use the Discussion forum to comment if the change is subjective! 3. Baseless comments do not have weight in considering something good or bad. 4. Starting flame wars, insulting people or other activities deemed as inappropriate or libelous conduct will result in you getting banned. 5. Vandalising this site is absolutely unfair not only to us seniors, but to the other Seladangs who wish to beneficially use this wiki. Therefore, vandalism may cost you your account. 6. We promise to keep your information absolutely private. However, for us to keep that promise, you must not reveal this site or even the mere existence of this site to any non-Seladang. 7. Please report to Sien Yi or any other admin if any member flouts these rules. 8. We admins do have the right to do stuff to your account like banning it from this wiki. 9. If your account is banned, please see Sien Yi to regain editing privileges to the wiki. If you very well know why you've been banned, Sien Yi expects an apology face-to-face.